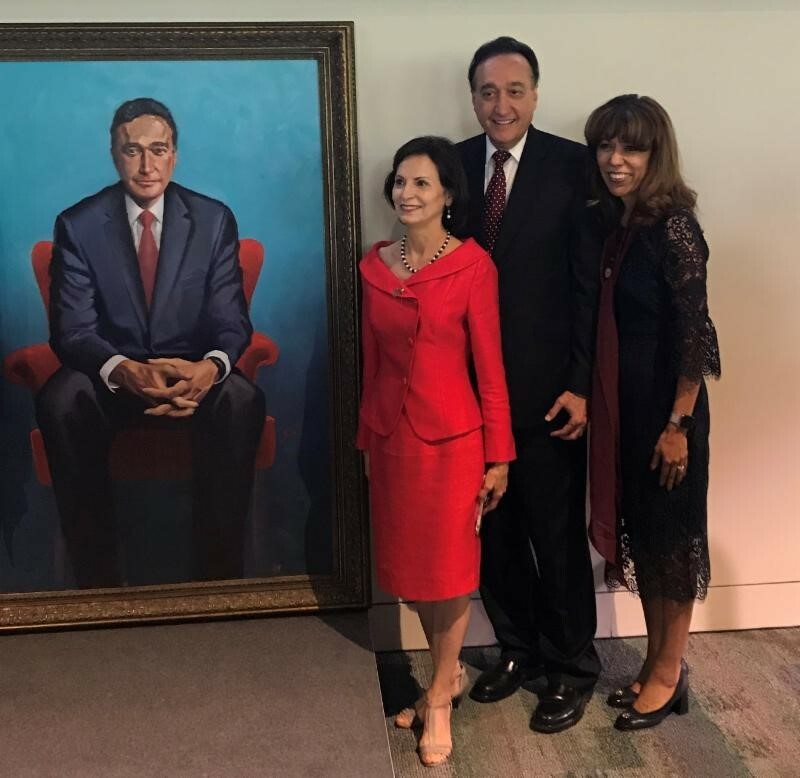 L to R: Mary Alice Perez Cisneros, Dr. Henry Cisneros and Dr. Cynthia Teniente-Matson pose next to the portrait of Dr. Cisneros painted by Lionel Sosa. On Wednesday, Oct. 3, A&M-SA honored the Honorable Henry G. Cisneros with its 2018 Dream Maker Award. The former Mayor of San Antonio who served as Secretary of the U.S. Department of Housing and Urban Development in the Clinton Administration, Dr. Cisneros is founder and chairman of the Cityview companies, which works with urban home builders to create homes priced within the range of average families. Texas A&M University System Chancellor John Sharp presented Dr. Cisneros with the award, which recognized his leadership in public service, his role on the A&M-SA President's Advisory Board, as well as his pledge of $1 million to help establish an institute for emerging leaders at A&M-SA. In addition to the award, Dr. Matson presented Dr. Cisneros with a 68" x 54"-sized portrait of himself painted by artist Lionel Sosa. Plans are for the painting to ultimately hang in the new institute. Dr. Cisneros, who also serves as chairman of the Executive Committee and principal of Siebert Cisneros Shank & Co., L.L.C., a full-service investment banking and financial services company, joins 11 other Dream Makers previously honored by the University, along with other individuals, corporations and organizations that have significantly supported A&M-SA as members of the Dream Maker Society.